If you live in the Bournemouth area of Dorset and you are wondering how best to protect your home or your business, then get in touch with us. We will offer you the best possible advice from a team of high-class CCTV installers with years of experience behind them. CCTV surveillance systems have been proved to be a very effective deterrent against crime, but if a rare crime is committed then you also have the means to identify the culprit and bring that person to court. We will use our unrivalled expertise to provide the right system for your particular requirements – and we will also give you a free quotation. As a leading CCTV installer in Bournemouth, we are able to offer homeowners and businesses the full range of CCTV services. When you invest in a CCTV system from ourselves, you will be able to protect your property 24 hours a day, 365 days per year. What’s included? A system installed by ourselves will be one that uses the latest HD technology as well as letting you access your CCTV from anywhere in the world simply by logging on using your iPad, tablet or smartphone. All of this is backed up by our expert CCTV installers, a 12 month warranty and ongoing repair and maintenance services once your warranty is up. As you might expect, crime in Bournemouth is generally in line with the crime rates seen Nationally – and for a large town like this should be expected. Anti-social behaviour, criminal damage and theft are all average. CCTV can protect you from criminal damage and ASB and deter criminal acts of theft. 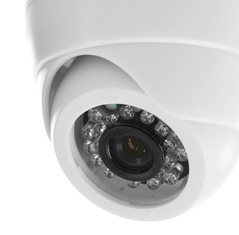 Many cameras work brilliantly at night, so if you suffer from night time crime, please ask us about infra-red models. We only use our highly experienced and qualified local CCTV installers. All based in the Bournemouth area, they can offer you fast and flexible fitting at a time and date to suit you. From flats bungalows and houses to shops, offices and large industrial complexes, we can come up with an effective CCTV solution that satisfies all needs and requirements. All of the CCTV systems we install utilise the latest in CCTV technology including the latest cameras offering sharp HD footage and the very latest digital video recorders. All of our systems have a full 12 month warranty for your peace of mind. Once this is up, we have a range of service contracts that represent excellent value for money and keep your CCTV system functioning as it should. The very fact you have CCTV up is a big statement of intent and one that potential burglars will take note of. Burglars will nearly always generally the most susceptible properties and CCTV will almost always scare them off. You must respect the privacy of others when installing CCTV cameras around your home. Cameras must be positioned so that they only monitor activity around your property and not your neighbours or anyone else’s home or outside area. It is always a good idea to speak to your neighbours about your plans. As well as the fact they may be recorded on camera, it shows you take security seriously and will suggest to them that your house may have better than average security forcing them to move on elsewhere. CCTV protects your property, regardless of whether it is a business or a domestic property 24 hours a day, 365 days per year. For a relatively small initial outlay, this level of protection represents a huge return of investment. One advantage of a CCTV system is that it can be used as a form of access control. If you have a knock at your door, you can have your CCTV system set up to know who is there before you open it. This is particularly useful for elderly or vulnerable people. Complete our contact form or call our friendly team on 0800 211 8310 to arrange your free, no obligation quote. We will come to your property at a time and date to suit you to. We’ll assess your needs and requirements and will come up with a quote that fits all of them as well as your budget. Get in touch today.